[FLOATABLE]: S3 is the longest floating pole for gopro on the current market, reach 39.5″ when it fully extend. [DETACHABLE]: S3 is combined with one extendable pole( from 12.5″ to 28″) and one floating pole(12.5″). These two poles can be divided and used separately. [LIGHTER AND STRONGER]: S3 is made of high class aluminium alloy and carbon fiber, adopt CNC production engineering tech to ensure it lighter and stronger. [EASY TO CARRY]: S3 is 12.5″ when it fully folded. It can be loaded in Smacase G360 or most of backpacks. -A flating pole 39.5″, but easily carry around, best selfie stick for travelers! Extendable pole (12.5″-28″) closely integrated with a floating pole(12.5″), Smapole S3 (12.5″-39.5″) appear. Two poles can be used alone, or with them connected together. S3 meets your needs both in water and on land, to be of use in all weather conditions. The unique combination is really convenient for your trip, don’t miss it! 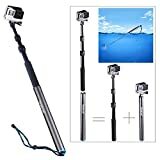 This entry was posted in Discount Photography and tagged 12.539.5, 5/4/3+/3/2/1/Session, Detachable, Extendable, Floating, GoPro, Hero, Pole, SmaPole, Smatree by Ball Photo. Bookmark the permalink.